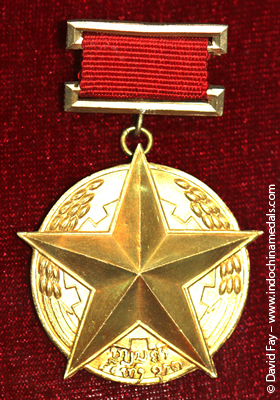 This is the highest award of the LPDR. It was given to the leader of Lao PDR and other senior Lao and foreign dignitaries. 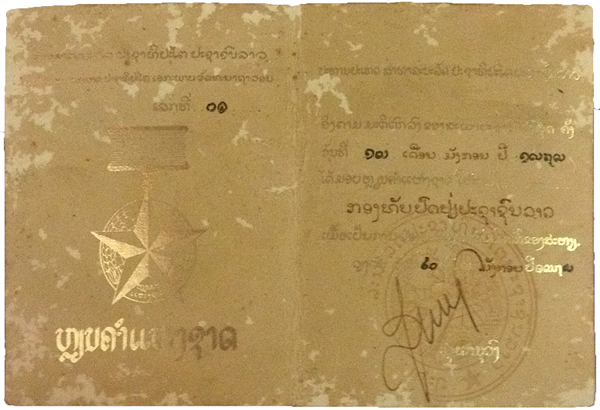 It was presented to Suphanuvong, first president of the Lao PDR, on July 13, 1989 on the occasion of his 80th birthday. 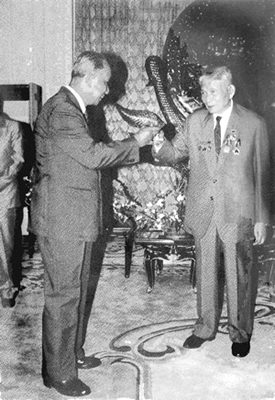 It was also presented to Vietnam Communist Party Leader Lê Duẩn during an official Lao visit to Hanoi on August 22, 1981. 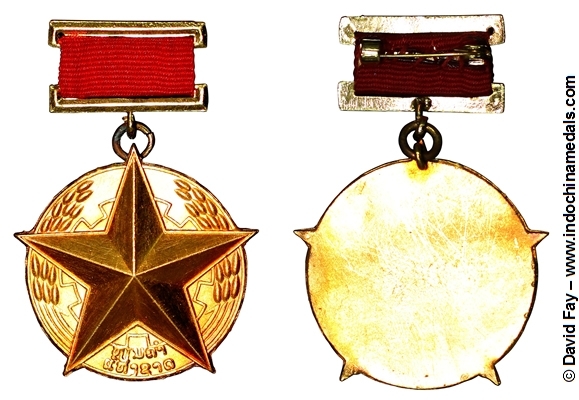 The medal is, of course, very rare. 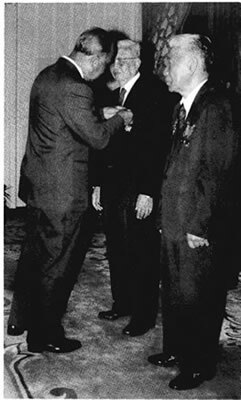 On November 25, 2008, in Vientiane, Lao PDR, President Choummaly Sayasone awarded Hun Sen – the Lao national gold medal – in recognition of his efforts in enhancing relations, creating good conditions and developing economies, societies and cultures between Laos and Cambodia. 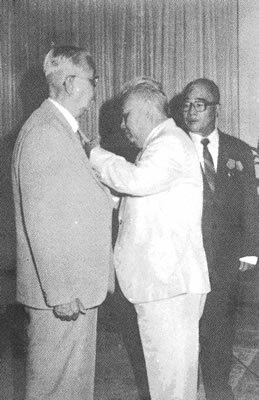 (KPL) Lieutenant General Choummaly Sayasone, Secretary General of the Lao People's Revolutionary Party and President of the Lao PDR presented on 20 January a national gold medal, the highest medal of the Lao PDR, to the Lao People's Army for its great contribution to the National revolution, defense and construction. 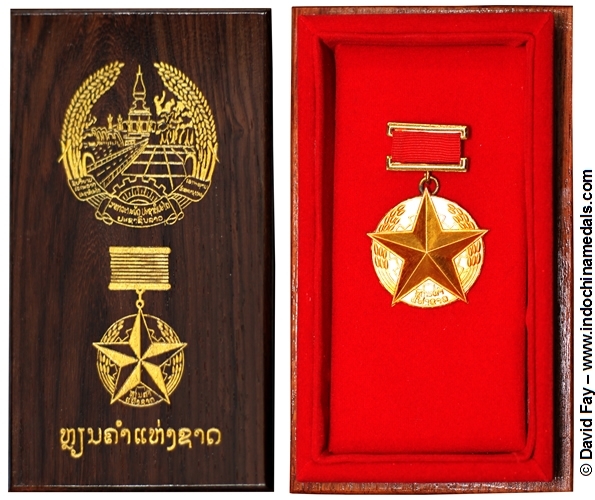 On this occasion, Lieutenant General Douangchay Phichit, LPRP CC Politburo member of the Party Central Committee and Minister of National Defense expressed thanks and gratitude to the Party and government for offering the highest medal of the nation to the Lao People's Army. He said that over the past 60 years of the growth and expansion of the Lao People's Army under the leadership of the Lao People's Revolutionary Party is a history to test the long fighting of the Lao People's Army (LPA) for national independence. The army joined with the people to gain victory over its enemies, enabling the Party and people to seize power from the old administration, abolish the monarchy and establish the Lao People's Democratic Republic. 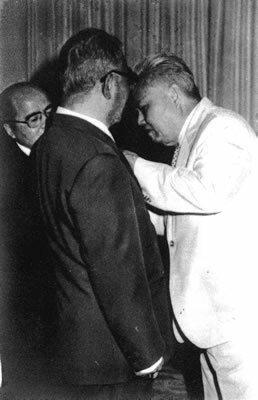 He added that over 60 difficult years of implementing the two strategies tasks of national defense, and construction full of honourable sacrifices, enjoying the Party's able and creative guidance, the LPA along with the entire people have fulfilled their historical obligations asked of them by the Party and the motherland. They have worthily written a new page of the nation's history. Mr Choummaly pinned a National Gold Medal on the LFNC.